The International Conference on Electromechanical Engineering, is a good opportunity to present and discuss new trends and exchange knowledge and experiences research progress in various domains of Electromechanical sciences and engineering. Both theoretical and applied papers are welcomed for submission to this event. This conference aims to provide a forum for researchers, and practitioners from academia and industry to discuss research ideas and present the recent advances in Electromechanical engineering and related topics. Students and junior researchers are especially welcome to share their latest research and application contributions and address new challenges in the field. With an anticipated 100 participants, the event will also provide an excellent opportunity for regional and more broadly international networking. 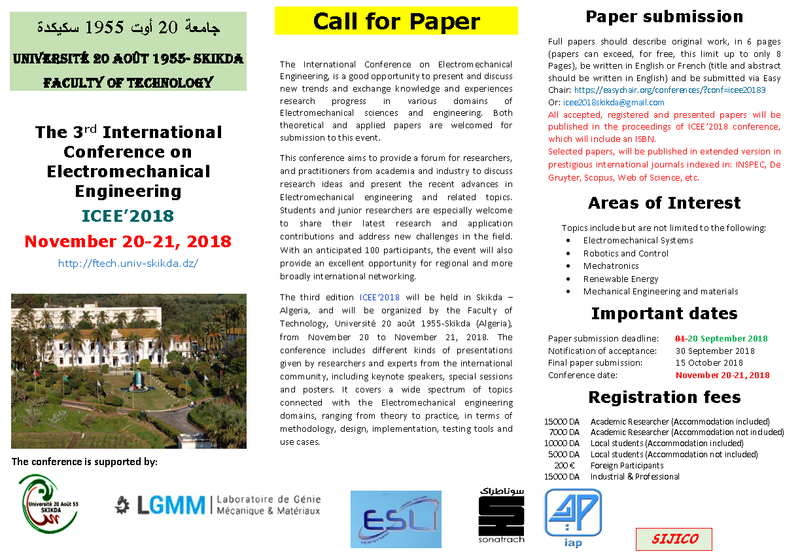 The third edition ICEE’2018 will be held in Skikda – Algeria, and will be organized by the Faculty of Technology, Université 20 août 1955-Skikda (Algeria), from November 20 to November 21, 2018. The conference includes different kinds of presentations given by researchers and experts from the international community, including keynote speakers, special sessions and posters. It covers a wide spectrum of topics connected with the Electromechanical engineering domains, ranging from theory to practice, in terms of methodology, design, implementation, testing tools and use cases.